December 15, 2010. Seattle, WA. The final week of our 2010 Pacific Northwest Tour. We left Seattle December 15th amid pouring rain and packed freeways a bit before the so-called rush hour, reminding us why automobile-dependent suburbs and outlying areas will have the biggest challenges now that oil production is in permanent decline. December 16, 2010. Portland, OR. We a taped a conversation with Daniel Lerch, co-editor with Richard Heinberg of The Post Carbon Reader: Managing the 21st Century’s Sustainability Crises, a compilation of essays by Fellows at Post Carbon Institute. It begins with our having reached the limits to growth, and looks at the interrelated challenges we face in fourteen different areas, including energy, agriculture, water, transportation, and of course food. What struck me is Daniel’s stating that “resilience” rather than “sustainability” is the orientation we need for planning and action. The uncertainties of global climate chaos and resource availability make”sustainability” a moving target and essentially impossible to define (much less plan for). But community resilience can be planned for and worked towards. 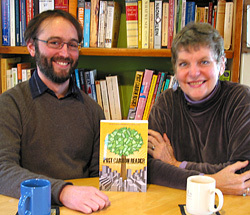 You can find the book at www.postcarbonreader.com. In their laudable efforts to widely disseminate this information, Post Carbon Institute is putting chapters from the book online. Watch Managing the 21st Century’s Sustainability Crises (episode 192).